The Mantis Shrimp is a beautiful animal, but care should be taken when adding one to your aquarium. 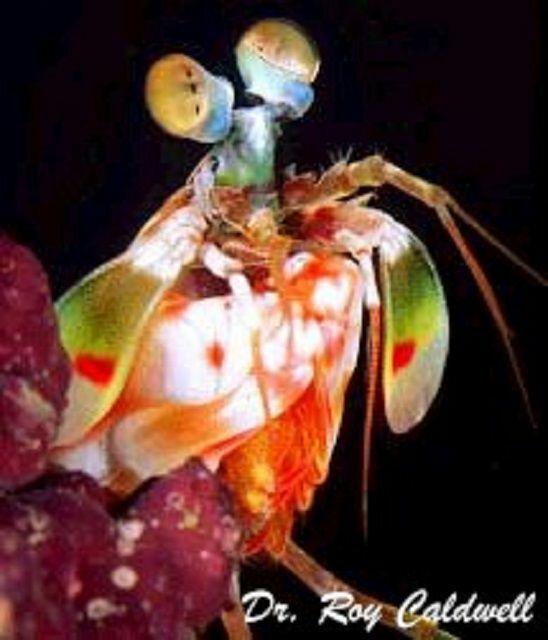 There are two hunting categories of Mantis Shrimps: the "spearers" and the "smashers". The "spearers" use their spear-like claw to silently stab soft tissued prey. The "smashers" use their forceful, club-like claw to hit, crack open or pulverize harder bodied prey. Continue to 2 of 37 below. This snap-shot of a Harlequin Shrimp (Hymenocera picta or elegans) taken by your Guides Debbie and Stan during a visit to the Maui Ocean Center in Hawaii. This little crustacean is also known as a Clown, Painted, or Dancing Shrimp. This is a very shy, mild tempered shrimp, as well as delicate and sensitive. It prefers hard rocky or coral substrates, rich with lots of hiding places. During daylight hours it keeps hidden and only goes out to feed at twilight hours, or complete darkness. It is almost always found in pairs with the female being the larger of the two. Continue to 3 of 37 below. The Blood Shrimp (Lysmata debelius) may seriously damage soft corals and small-polyped stony corals. This shrimp is normally nocturnal in nature, but may be seen during the day in a low light aquarium. Continue to 4 of 37 below. This shrimp has a blood red or scarlet body with a few white speckles on the anterior end. The legs and antennae are a stark white. The Blood Red Fire Shrimp, also known as Blood Shrimp, Fire Shrimp, or Scarlet Cleaner Shrimp, is one of the most popular shrimp in the aquarium hobby. Continue to 6 of 37 below. The Blood Shrimp (Lysmata debelius) prefers a habitat providing it with a cave or overhang where the lighting is not too intense. While it will tolerate its mate, others of its own kind will be chased away or harassed. It is generally peaceful with most other organisms in the reef system unless they impinge on its territory. Continue to 7 of 37 below. The Blood Shrimp (Lysmata debelius, as a "cleaner shrimp," will set up cleaning stations and remove dead tissue and parasites from fish that present themselves. It will also scavenge for meaty bits along the substrate bottom. Continue to 8 of 37 below. Peppermint Shrimp (Lysmata wurdemanni) are nocturnal and very shy during the day, protecting themselves from predators by staying out of sight most of the time. However, at night when the big boys are napping, this shrimp forages the system looking for a meal. The Pacific Cleaner Shrimp, true to its name, will clean parasites and debris from marine fish. It will even clean parasites from the mouth and gills of compliant fish. Contrary to popular belief, its red and white stripes do not totally protect it from predation by larger fish and eels. Continue to 10 of 37 below. This photo of a Pacific Cleaner Shrimp (Lysmata amboinensis) taken by your Guides Debbie and Stan during a visit to the Maui Ocean Center in Hawaii. Continue to 11 of 37 below. The Pacific Cleaner Shrimp (Lysmata amboinensis) is also known as the Scarlet Skunk Cleaner Shrimp and the Red Skunk Cleaner Shrimp. Continue to 12 of 37 below. The Pacific Cleaner Shrimp (Lysmata amboinensis) is often found in groups among live rock or coral. In the home aquarium, the Scarlet Skunk Cleaner Shrimp requires similar habitats and peaceful tankmates. Some fish, such as Hawkfish and Lionfish or predatory shrimp or crabs may see this member of the Hippolytidae family as food. Like other invertebrates, the Pacific Cleaner Shrimp is intolerant of copper-based medications, high nitrate levels, and fluctuating water parameters. It also requires the drip-acclimation process when first introduced to your system. Continue to 14 of 37 below. The Pederson Cleaner Shrimp (Periclimenes pedersoni) is also known as the Caribbean Anemone Shrimp is endemic to strictly the Western part of the tropical Atlantic and Caribbean oceans. Continue to 15 of 37 below. Many believe that this shrimp is safe with eels, however it has been shown that at least the Snowflake Eel will eat this shrimp when it becomes tired of the shrimp constantly picking at it. Continue to 16 of 37 below. A Coral Banded Shrimp (Stenopus hispidus)as it emerges from a crevice in the reef. These shrimp are common as pairs under rocks and ledges, remove parasites from fishes and attain a body length of about 3 inches. Stenopus hispidus gets along well with most fish and invertebrates in an aquarium. However, triggerfish and many eels will dine on Coral Banded Shrimp when given the opportunity. This shrimp will actively clean fish, when presented with parasites. Continue to 18 of 37 below. The Cauliflower Coral Shrimp (Alpheus lottini) which lives among branches of Cauliflower Corals. Continue to 19 of 37 below. A photo of a number of Wire Coral Shrimp (Pontonides unciger) which is uncommonly found on and difficult to spot among the Wire Coral's tentacles. The Wire Coral Shrimp is normally less than 1cm in length. Continue to 20 of 37 below. A photo of the Ghost Shrimp (Stenopus pyrsonotus) which is rare under ledges in deeper water, removes parasites from fishes and attains a body length about 4 inches. The Goby Shrimp (Alpheus rapax) which inhabits burrows with the Goby [i](Psilogobius mainlandi). This shrimp is Endemic to Hawaii and is common in shallow silty areas. Continue to 22 of 37 below. Continue to 23 of 37 below. The Reticulated Hinge-Beak Shrimp (Cinetorhynchus reticulatus) is often seen during night dives with their golden eyes. Several species occur in Hawaii, the largest species being the striped R. hiatti at 4 inches. Continue to 24 of 37 below. The Uniform Hinge-Beak Shrimp (Cinetorhynchus concolor) which is often seen during night dives with their golden eyes. Several species occur in Hawaii, the largest species being the striped R. hiatti at 4 inches. The Marbled Shrimp (Saron marmoratus) which is abundant on shallow reefs at night with their golden eyes revealing their presence. Their color varies from green to reddish brown. The males have longer arms than the females. There may be more than one species in Hawaii. Continue to 26 of 37 below. The Minstrel Shrimp (Metapenaeopsis hilarula) which is occasionally spotted on night dives, buried in the sand. Related to the edible shrimp from deep water. Continue to 27 of 37 below. The Mud Shrimp (Callianassa sp.) inhabits burrows in shallow water. The body is soft and vulnerable to predators. The body of this shrimp attains 2 inches in length. Continue to 28 of 37 below. Possibly a new species found at Midway in 1999 closely related to R. uritai in Japan, this Rhynchocinetes species discovered on Midway has solid red legs, not banded brown & white. Rarely seen in small holes on shallow rubble reefs in the lagoon and in caverns in the reef front. A single specimen was trapped on 9/24/02 during the NOW-RAMP 2002 expedition. A Sea Star Shrimp (Periclimenes soror) which are common as pairs under various Sea Stars. Their color (in this case Purple) usually matches the color of the host. They attain a length of about 1cm. Continue to 30 of 37 below. A Sea Star Shrimp (Periclimenes soror) which are common as pairs under various Sea Stars. Their color (in this case Yellow) usually matches the color of the host. They attain a length of about 1cm. Continue to 31 of 37 below. A Sea Star Shrimp (Periclimenes soror) which are common as pairs under various Sea Stars. Their color (in this case Red) usually matches the color of the host. They attain a length of about 1cm. Continue to 32 of 37 below. From Keoki's Fish Corner, a photo of an unidentified transparent shrimp living on stinging hydroids. This shrimp was only found once at Haleiwa Trench. A rare shrimp found on Echinothrix spiny urchins and attains a length of about 2-3 inches. Continue to 34 of 37 below. The Common Mantis Shrimp (Pseudosquilla ciliata), commonly found on weedy reef flats in shallow water. Their color varies from white to green. Continue to 35 of 37 below. A Burrowing Mantis Shrimp (Oratosquilla oratoria), a large species that inhabits sandy burrows. Continue to 36 of 37 below. The Peacock Mantis Shrimp (Odontodactylus scyllarus) is a beautiful animal, but care should be taken when adding one to your aquarium. There are two hunting categories of Mantis Shrimps: the "spearers" and the "smashers". The "spearers" use their spear-like claw to silently stab soft tissued prey. The "smashers" use their forceful, club-like claw to hit, crack open or pulverize harder bodied prey. Many believe that this shrimp is safe with eels, however it has been shown that at least the Snowflake Eel will eat it when it becomes tired of the shrimp constantly picking at it.